If you can get a pan hot enough, but not too hot, fruit will positively melt into a lovely semi-soft consistency, its natural sugars caramelizing just a touch. 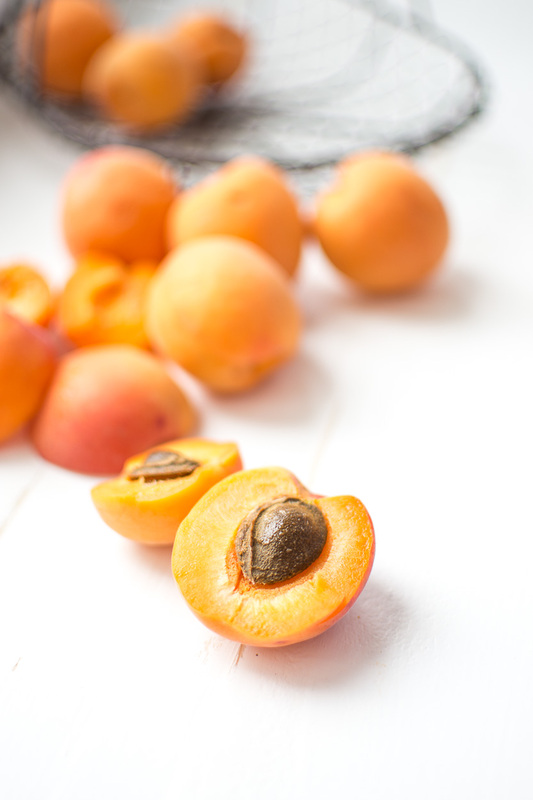 Naturally soft, tender fruits, like stonefruit and berries, yield themselves beautifully to this technique, with apricots being a favorite. I start first by warming butter in a hot pan until it froths and foams, before tossing the apricots into the pan until they just begin to soften, their edges melting into one another and their skins blistering in the heat ever so slightly. Then I pull them from the pan, top them with sweet, lusciously red raspberries and a dusting of ground pistachios which gives the dessert a lovely creaminess. 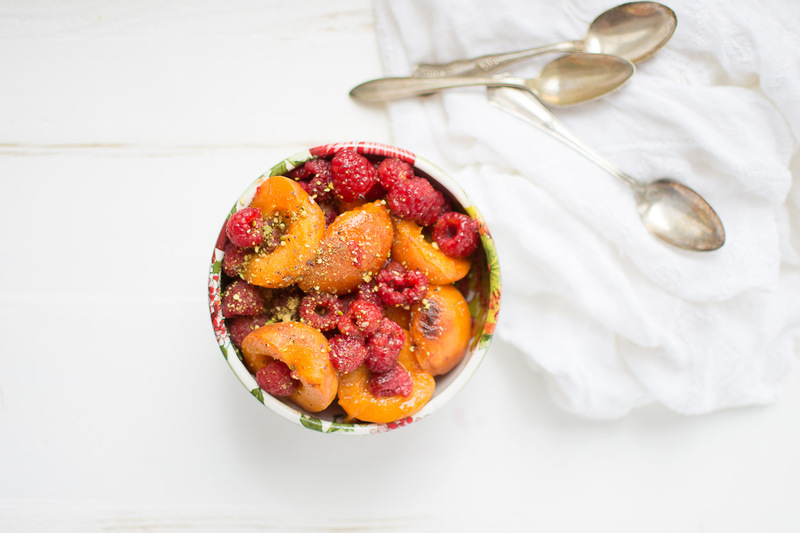 I serve the apricots and raspberries on their own, in little dessert bowls, though a drizzle of honey and dollop of whipped cream or Greek-style yogurt can provide a nice pairing. Tender and fussy fruits, apricots tend not to travel well which means that they’re relatively difficult to find out of season. They arrive in a flurry of abundance, and then, with a blip, they’re gone for another year. Apricots, like most other fruits, are particularly rich in antioxidants like vitamin C, beta carotene, cetechins and quercetin. A particularly potent flavonoid, quercetin supports cardiovascular health with some studies showing that it can reduce LDL cholesterol levels in people at risk of heart disease (read it here). 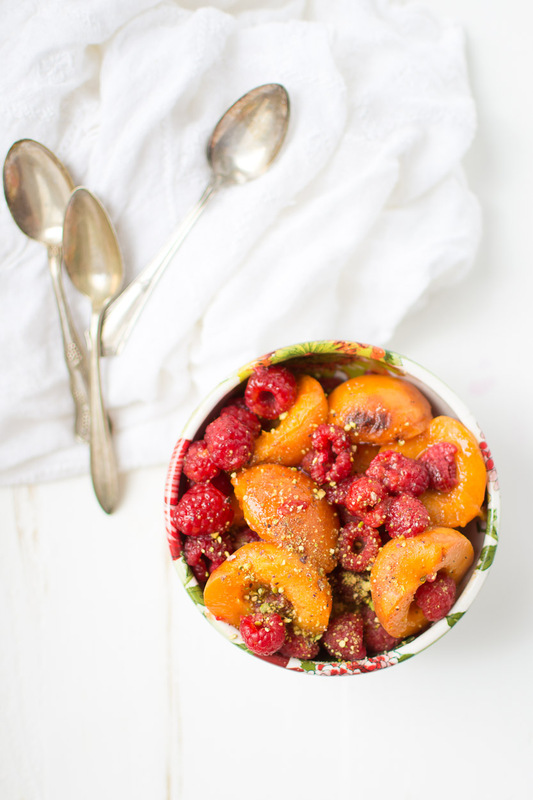 These fresh apricots positively melt in the heat of the pan before you toss them with fresh raspberries and sprinkle them with the lightest dusting of pistachios for an easy, no-fuss, one-pan dessert with no added sweetener. Melt the butter in a nonreactive skillet (like this one) over medium-high heat. When the butter melts into froth and foam, toss in the apricots, stirring frequently to prevent them from scorching, until they begin to soften ever so slightly. Spoon the melted apricots, and any remaining juice, into a serving dish. Top them with fresh raspberries and a dusting of finely ground pistachios. Serve immediately. The metals of some cookware, particularly cast iron, aluminum and unlined copper, react with the foods you cook in them. While pans made with these types of metals conduct heat very efficiently, they will leach those metals if you cook acidic foods in them. So, for fruit and other acidic foods, choose nonreactive pans like stainless steel or enameled cast iron. We recommend these nickel-free stainless steel pans as well as this enameled cast iron cookware. Summer is positively brimming with fresh, ripe fruit before its stonefruit and berries give way to autumn’s pears, grapes and apples. Sometimes all you need is fresh fruit, served on its own, to finish a meal, but, other times, it can be fun to add just a touch of natural sweetener and make something wonderfully fresh and sweet for your family. Fermented Mixed Berries only need a few days to culture, and when they’re finished you have a lively, tart, vibrant relish you can add to homemade yogurt, or serve over sourdough pancakes. Blackberry Mint Popsicles combine sweet, inky blackberries with mint-infused whipped cream for a delicious, gorgeous dessert. Strawberry Mint Sorbet is clean, light and sweet, blending summer’s ripest strawberries with fresh mint and the lightest touch of honey. You had me at ‘melted.’ Those looks delish! Apricots are awesome here in GR, MI right now! So are raspberries but they are very expensive compared to blueberries! But, I think I will grab some raspberries when I go to the farmers market today along with apricots so I can make this! It truly sounds awesome!! Oh, Jessica, they are fantastic. All sweet and tart and warm. We ate them after a serious meal of roast chicken with truckloads of vegetables. Congratulations on your wedding. The photos were beautiful. Todd, apricots and blueberries go crazy well together. So yummy. Melted blueberries are also very good, especially with a pinch of powdered ginger. This looks heavenly, and if it’s simple all the better. I love simple desserts too, especially when it comes to fresh fruit in the summer time! Love this idea!!! Jenny, take a couple of weeks off and get caught up. All your readers will understand. 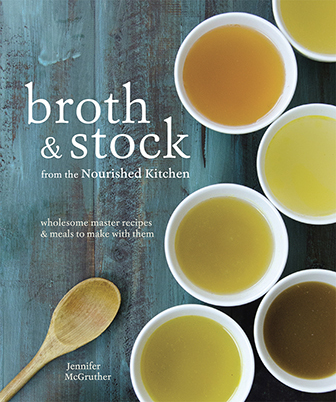 We’d rather have fewer posts and recipes and a healthy Jenny than a regular posts and a stressed out, overworked Jenny. You could still do your menu plans and other deliverables you need to do, Trust me, you will come back feeling better about being organized and with a new energy for recipes and such. You have to take care of yourself! 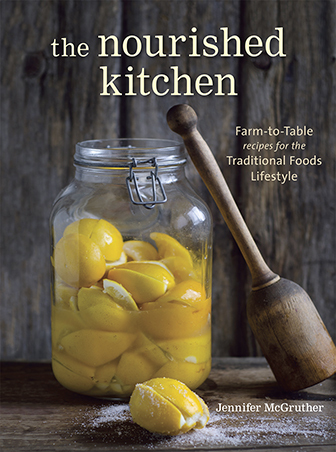 If it wasn’t for you, I would have never found out and learned about traditional foods and WAPF. There are others out there that will need you to start them on their journey! I’d love to do this with apples, would anything change in the receip?